Kids aren’t the only ones who get dirty at school. All of the art projects and hands-on activities can take their toll on teachers’ clothes as well. 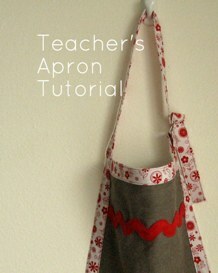 Chris from Pickup Some Creativity shares a tutorial on her blog for this Teacher’s Apron. Make one for your child’s teacher to show your appreciation for all of the patience shown to your little one throughout the year. Go to the tutorial.